05:00 Weather, and local, provincial, national, and global headlines. Stopping Port of Vancouver expansion, BCLC wants more casinos, sleepover at City Hall on the housing crisis. 16:15 China’s Tiananmen Square – 27 years of suppressed memory. Plus check out this weekend’s CHINA NOW: INDEPENDENT VISIONS at The Cinematheque. 22:45 Mary Hannaburg (Mohawk Nation Director for Quebec Native Women) on her recent Honduras human rights solidarity meeting, Berta Caceres murder investigation, and Toronto-based Aura Minerals gold mine. Mary is from Kanesatake, Oka, Quebec and a mother of six children and grandmother of one. Join the June 15 Global Day of Action. 37:30 Donald MacPherson Executive Director of the Canadian Drug Policy Coalition and one of Canada’s leading figures in drug policy talking about the new good samaritan law brought before the House of Commons by Ron McKinnon, Liberal MP from Coquitlam-Port Coquitlam. We also talk fentanyl, Prince’s overdose, and the role of media and education. 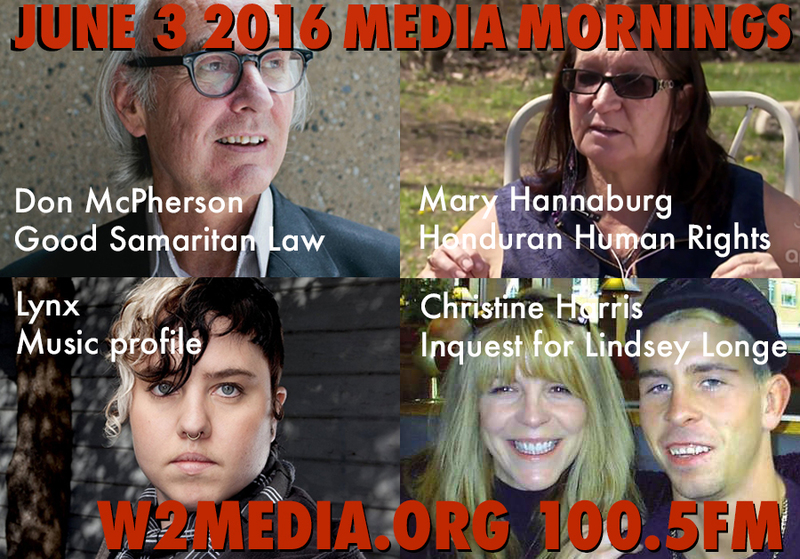 51:30 Christine Harris – Appealing the denial of a provincial death inquest for her son Lindsey Longe, and assisted living standards of care in BC. Christine is a grieving mother who lost her son Lindsey in 2012 in what looks like shameful negligence, despite the fact she had been promised all residents in his supportive housing would be checked on every day. Lindsey came home from St. Paul’s hospital, (driven out by unsympathetic and inadequate pain control there) and was ignored by his residence staff. He died after four days alone and his body was only discovered after another three days of being ignored. Lindsey is not the only resident of such housing in Vancouver to die and be ignored. A Freedom of Information request eventually elicited the information that in Vancouver from 2010 to mid 2015, over a quarter of all residents in supportive housing who died were not discovered for between two and five days! BACKGROUND and ACTION for Lindsey Longe’s death in BC supportive housing. More Video background here from CFAX Radio. Christine Harris wants an independent inquiry into these deaths, and policy reforms to keep more parents from having to live with the anguish this tragedy has cost her. Please share this to Facebook and other social media urge your contacts to join you in emailing the Premier, the coroner and appropriate ministers calling for a coroner’s inquest into Lindsey’s death and an independent inquiry into all the deaths ignored in supportive housing. A single death like Lindsey’s is a tragedy. The number of such deaths in housing the province is responsible for looks like negligence, and it must stop. Here is a link to a moving interview with Christine on Ian Jessop’s CFAX talk show recently, and below that, the link to my original column about this matter. Finally, below that, email addresses you can use to tell the government you want Christine Harris to get the answers to her questions about why her son died in such a lonely, unattended fashion. Speak truth to power: Here are government addresses.